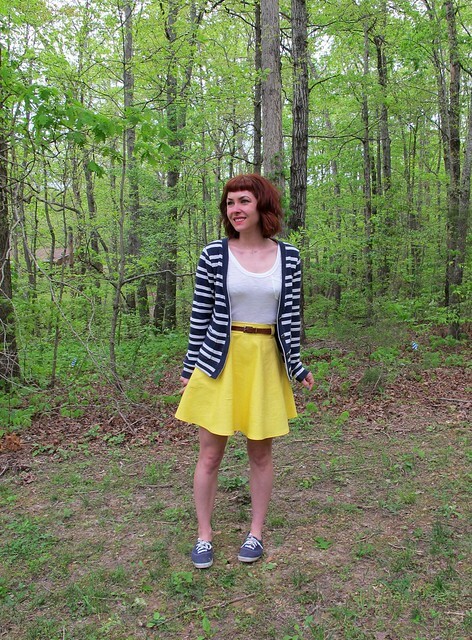 Home Cardigans	Colorful Spring Separates! Last month, I spent a long weekend in NYC. Since I’m a practical person with adult priorities, this meant that I spent 2 days shopping in the Garment District, with most of my time being focused on the Mood Fabrics flagship store. Don’t even judge me. Wait until I show you what I got my hands on, first. Do you see that navy and white striped fabric??? Ok, go ahead and judge. I’ll wait. As much as I love ordering from the Mood Fabrics website from the comfort of my own home (and in the comfort of my underwear, because, like I said – I’m an adult and I do what I want), nothing can compare to the thrill of being able to actually visit the store and put my hands all over all that glorious fabric. I only manage to make it up to the city a couple of times a year, but I make it worth my while. I write a list of things that I’m looking for, without being too specific (example: “2 yards cotton sweater knit for cardigan,” but I try not to limit myself to colors or styles because you never know what you’ll find! ), but I also keep an open mind for whatever jumps off the shelves at me. This navy and white striped fabric goes both ways – I knew I wanted a cotton sweater knit for a summer cardigan, and that damn fabric totally screamed my name when I walked by it. I call it a sweater knit, but it’s truly a double knit – a thick fabric comprised of 2 layers of knit. It’s soft and squishy and the faded navy and off-white stripes give it a seriously good nautical vibe (are you sick of nautical? HA HA TOO BAD, I sure ain’t!). It has a little bit of drape, a lot of structure, and I knew it would be the perfect fabric for my summer sweater. Summer sweater might sound like an oxymoron coming from someone who lives in the south, but let me tell you – those Southerners do NOT mess around when it comes to a/c. Everywhere you go – save for outside, obviously – is at least 60 degrees with a wind chill. Brr. I used the SBCC Cabernet cardigan for my pattern. I cut all my fabric on a single layer, taking great pains to match all the stripes, as well as the stripes on the sleeve cuffs and hem band. The neckband is actually cut from the same fabric, but I positioned it so when folded in half, you only see the widest navy stripe. I wanted a solid neckband, but didn’t want to try to color match because I knew it would be difficult. This fabric was very easy to work with and not terribly prone to shedding. All the construction was done on my serger, and the topstitching was done on my regular machine with a walking foot and a straight stitch. The most important thing to keep in mind if you’re sewing up a sweater knit is to REALLY press everything after you’ve sewn it. Those thick knits can get really lumpy, really fast, and that’s the quickest way to make something look super homemade. The topstitching also helps with keeping everything nice and flat, but forreal – don’t skimp on the pressing! 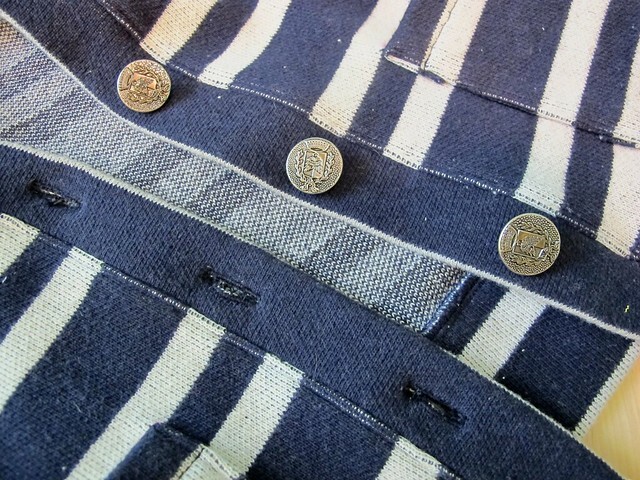 Here’s a close-up of the stripey goodness. Buttons are from my stash. 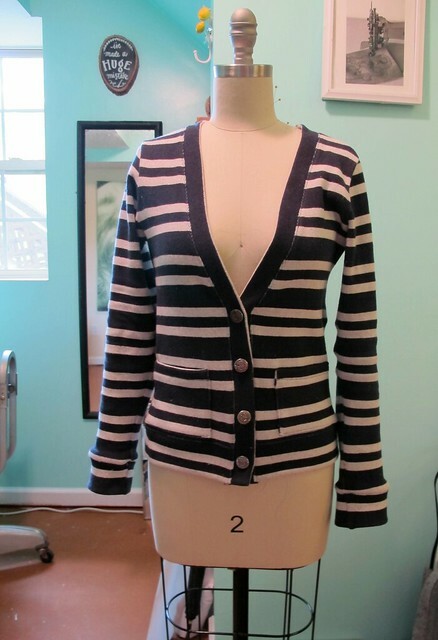 Unfortunately, as I bought this stuff in the NYC store, it’s not available online, but here’s another amazing stripey French terry knit that I recently discovered online. I’m holding off because it’s wool and wool REALLY is not my friend in the summer, but someone should buy it! 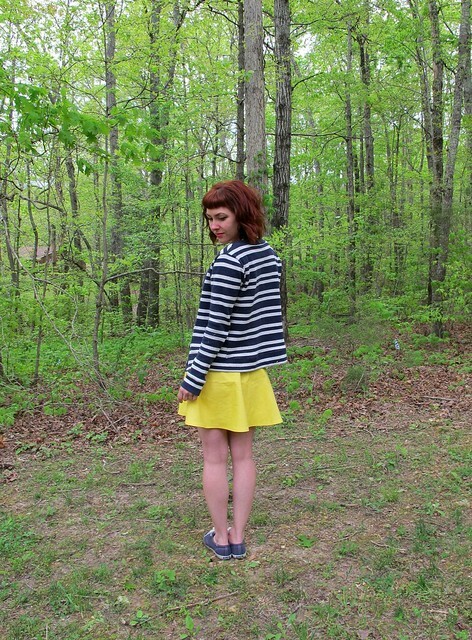 So, the sweater is the real star here – but I also made the rest of my outfit! The skirt is a Sewaholic Hollyburn, sewn up in a lovely bright yellow stretch cotton twill (purchased at the NYC Mood Fabrics store, but there are tons of cotton twills online, too!). 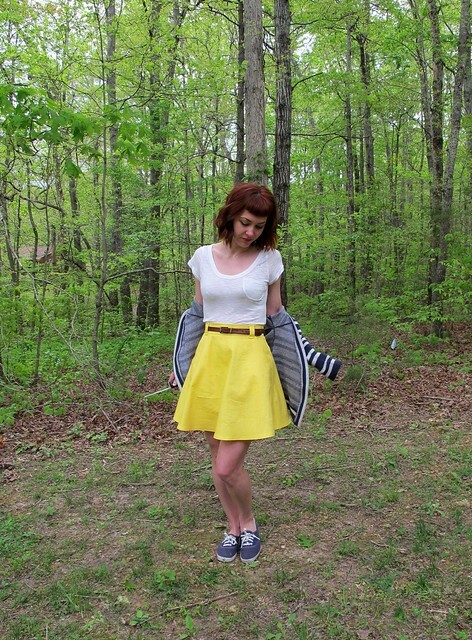 I love love LOVE this shade of yellow – it’s so sunny and happy! 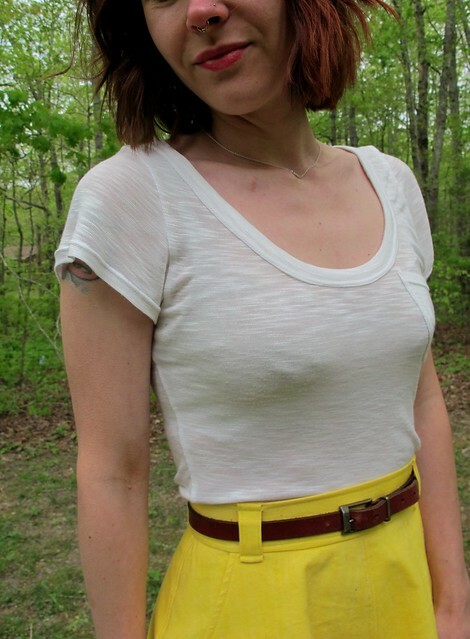 It also looks absolutely terrible with my skin tone, which is why I made it into what is basically the happiest skirt of all time. This twill has a lot of spandex, so there’s a dense, heavy stretch to the fabric. I couldn’t get a good press because of that, so all the seams are topstitched down. The skirt closes in the back with a simple lapped zipper. My simple tshirt was made using this sheer slubbed rayon knit and a my Frankenpattern’d tshirt pattern. This is a beautifully soft fabric with a nice texture, but be warned – it is SUPER sheer! It was a little difficult to sew because it was so shifty, but it pressed well and I think the overall look was worth it. If anyone needs me, I’ll be on my boat. Probably scheming a way to get back to the Garment District.